Wearing blanket (First Phase), Diné (Navajo), Arizona or New Mexico, 1840–60. Wool weft-faced plain weave. Denman Waldo Ross Collection. “Collecting Stories: Native American Art” explores the range of perspectives, motivations, and voices involved in building the early holdings of Native American art at the Museum of Fine Arts, Boston. 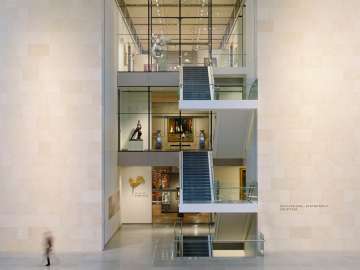 The exhibition focuses on objects collected in the formative years after 1876—the year the Museum opened its doors to the public. Highlights include an early Diné (Navajo) wearing blanket (1840–60), a pair of important Eastern Woodlands moccasins (early 19th century), and a Plains roach, or headpiece, made of deer and porcupine hair (about 1880–85). Often inspired by notions of “authentic” Indian life, many East Coast collectors traveled to the Great Plains and Southwest during this period, encountering indigenous artists who created objects for use within their communities and for tourist markets. As both works of art and souvenirs, these objects initially fit into the MFA’s educational mission to represent art in all media and from all cultures. However, Native American art became less visible in the galleries during the early 20th century, and like other encyclopedic art institutions, the MFA lent or donated most of its holdings to ethnographic and archeological museums. “Collecting Stories” confronts this moment in our institutional history, and seeks new ways to interpret these understudied objects and include voices of indigenous artists of the past and present. This exhibition and its related public programs raise questions that may not have clear answers. How did these objects get here? Who made them? What motivated their makers and collectors? This is the first in a series of three exhibitions funded by the Henry Luce Foundation that will use understudied works from the MFA’s collection to address critical themes in American art and the formation of modern American identities. Roach (headpiece), Northern Plains, Wyoming or Montana, about 1880–85. Generously supported by the Henry Luce Foundation. This exhibition is part of a series of three, one-year exhibitions that use understudied works from the MFA’s permanent collection to address critical themes in American art.